You've found the “U.S. Merino Sheep Breeders” page here at Hobby Farm Wisdom! If this is the first time you have visited our site: Welcome! The Merino is a breed of fine-wool sheep originating in Spain; it was known as early as the 12th century. It was particularly well adapted to semiarid climates and to nomadic pasturing. 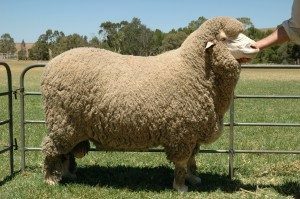 Merinos vary considerably in size, conformation, and extent of skin folds, but the prevailing trend in breeding is to develop sheep of medium size, with fair mutton conformation and a minimum of skin folds. The rams weigh between 250 and 330 lbs, and the ewes between 200 and 250 lbs. The color of their face and legs is white. They have a considerable growth of wool on their faces. The fine wool fibers of Merino fleeces are beautifully crimped. The staple length is between 6 – 10 cm and they have a micron count of 24. They are economically influential and sough after and they are prized for their wool.